A NEW restaurant/café/bar is due to open next Wednesday (31 October) at the Commercial Way end of Church Path. 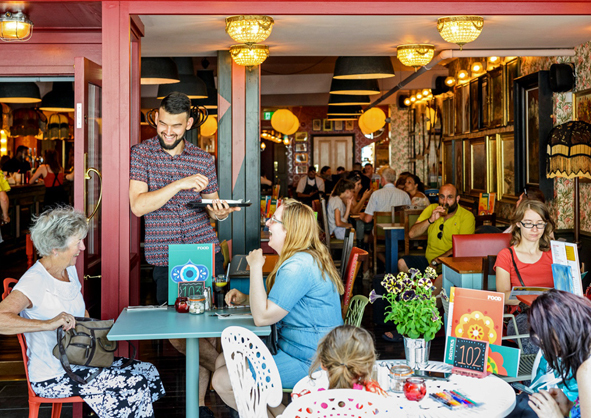 Marciano Lounge, which will employ 25 local people, is the latest of more than 100 similar venues around the country operated by the Bristol-based group Loungers. The Woking branch will support the town’s homelessness charity the York Road Project with donations of 50p from every burger and 10p from every coffee sold during the first month of trading. A spokesman for the group said that the Mariano Lounge “will be a home from home, offering delicious food and drinks, all day. The atmosphere of the various “lounges” is high-quality but relaxed dining, with eclectic décor, described by Loungers as “potty”. The all-day menu will include tapas and burgers, beef chilli, paninis and mac and cheese. There will also be a specials menu, options for children as well as vegan and gluten-free dishes. There will be a community notice board, a book swap area and regular fundraising events.